A staggering 3,188 objections have been lodged in opposition to a planning application to build a hotel in and around the former Royal High School building that sits on the south side of Calton Hill, at the heart of the World Heritage Site. In contrast, there were a mere 283 expressions of support for the plan to cram development onto the site and diminish the setting of the A-listed Greek-Revival building. The natives are restless! This is the latest stage in a saga that has been going on for a couple of years, and the signs are that it represents a deeper unease amongst citizens of "The Ahens of the The North" about planning and developmen. For the last five years the Council has been ruled by a coalition of the Scottish National Party and Labour. Like most local authorities in the UK it has had to cope with significant reductions in its budgets, which depend hugely on grant allocations from central government. Local councils have little room for manoeuver financially, yet demands on their services are ever increasing. The escape hatch is to sell off assets, notably land and buildings. A fire sale of sites and properties is bad news for planning in general and for urban conservation in particular. Deals must be done, and the role of the planning system is at best a second thought, at worst a bureaucratic dead weight holding back investment, jobs and economic development. So it was that in 2013, as part of its "Strategy for Jobs 2012-17" the City of Edinburgh Council launched The Edinburgh Twelve. Three of the city's top property agents were hired to identify gap sites in "the city centre" (which also happens to be the World Heritage Site), and show how the Council could get them developed. Notwithstanding its planning responsibilities, or the extra obligations of the Outstanding Universal Value concerns in the World Heritage Site, the Council positioned itself as a landowner desparate to sell and chasing developers. Not surprisingly, there have been takers. Several of the developments elicited in this way have provoked angry responses, even ridicule. In August 2015, planning permission was granted for development on one of the sites, against the recommendation of the planning officers. The centrepiece of the development in what developers and the Council are calling the St.James Quarter is a hotel that breaches the skyline of the 18th century New Town, so as to provide patrons with panoramic views of the city. The architects describe the ribbon feature atop their creation as having been "conceived to be elegant and ethereal, as if flying like a pennant in the Edinburgh breeze." The locals are calling it "The Golden Turd". At another Edinburgh 12 site, this time in the Old Town, a former registry office is being disposed of, and again a planning permission has been granted (by 8 votes to 6) for a £65M 225 bedroom hotel development, at the A-listed India Buildings, with the scheme also involving a B-listed church and a further C-listed bulding. The anger this generated meant that the story made it into The Guardian, a UK national newspaper. The two main concerns are that the traditional Old Town community is being squeezed out by development of hotels and new-build student housing, and that the hotel will take away for ever the space into which Edinburgh's magnificent Central Library - gifted like so many others by Andrew Carnegie - could expand. Crucially the land in question was bequeathed to the city for this purpose - not to sell off to help balance the council's books. The active community organisation in the Old Town is fundraising to take the case to judicial review. Of course, the developes are promising "hundreds" of jobs, in a city which is blessed with full employment. The jobs are likely to be mainly in hospitality and construction, two sectors pleading for special immigration quotas post-Brexit so they can overcome their labour shortages. The former Royal High School building on Calton Hill, facing the Salisbury Crags and overlooking Holyrood Palace, is, as the Edinburgh 12 bulletin says "one of Edinburgh's most recogised landmarks". In any other context that should mean that it is treated with great care, but in the estate agent language used, it is "benefitting from a prominent location on Regent Road", as might be said if it were a disused petrol filling station being touted for redevelopment. Long underused, and once saved as the site for a future Scottish Parliament, the Council-owned property has been leased to developers until 2021, with the aim of converting it into a "luxury hotel", which aims to attract the super-rich, especially from Asia. So the deal was done: then came the matter of planning permission. Plans for a 147 bedroom hotel, with wings either side of the A-listed school were presented in 2015, and attracted 415 expressions of support but 1743 objections. It took seven hours of debate for the councillors to support their planning officers' recommendation for refusal. Subsequently, plans were submitted to refurbish the buildings for a music school, and unanimously approved. However, the developers still have their lease, and appealed. Then, with the inquiry pending late last year, they asked for things to be put on hold, so they could prepare a revised scheme. This has clipped 20 rooms off and lowered the new buildings, but makes no serious concession to the concerns of the objectors. Hence, as more and more people have become aware of the plans, so the number of formal objections has actually escalated, while expressions of support have fallen away. 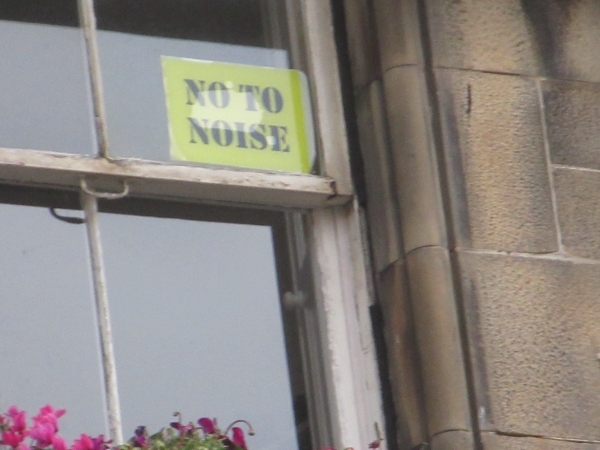 The applicants asked the Scottish Government to call in all three applications, the two for the hotel plus the music school, and process them through one inquiry. Maybe sensing a hot potato, the government politely declined to do so. This means that the revised application will go to the city council for decision, though, of course a refusal will probably be followed by an appeal and a public inquiry. This is the backdrop to the local council elections which will take place on 4 May. Edinburgh World Heritage organised a Heritage Hustings, whcih I attended. Candidates from the five main political parties in Scotland (no, UKIP is not one of them) answered questions from an audience of around 200 people. There was palpable anger and distrust, and most of the questions were prefaced by a polemic. What emerged was a sense that the elected representatives have betrayed their role as stewards of the urban heritage of Edinburgh. The candidates themselves generally conceded that "the balance" had been wrong, with the siren calls of investment and jobs being granted too much attention at the expense of conserving the historic environment. However, nobody was quite prepared to take the blame. Generations of errant Scottish schoolchildren have pleaded "It wisnae me" when confronted with their misdemeanours. So it was with the politicians; they were not on the Planning Committee at the time, or had voted the right way if they were; they would support third party rights of appeal - or a "no appeal" system - but the Scottish government will not go there; again, they were powerless, because the Scottish government can so easily override planning decisions at local level; what's more the universities are expanding, so much more student housing is needed, but it would be nice if it could be spread around the city, rather than being concentrated in tradtional nighbourhoods close to the centre; similarly, the pressure is on for more hotels, and the rise of AirBnB effectively allows change of use, and real loss of housing, to sidestep the planning system. All hoped that the new Management Plan for the World Heritage Site would solve the problems (it won't). I came away feeling that the planning system in Scotland is in a deeper crisis than most of those inside the system realise. Of course the audience was self-selecting, but to many it seemed like the planing system is a charade, pretending that it is open and inclusive, but in reality the plaything of developer interests and of politicians seduced by the lure of investment and "transformational" projects. I was there in my capacity as Chair of the Cockburn Association, Edinburgh's Civic Trust. Before the meeting I was able to distribute copies of the Civic Agenda that we have produced ahead of these local elections. It accepts that Edinburgh will grow, but charts a way forward to ensure it stays a thriving city, a special place in which citizens have a say in its stewardship. That's what planning should be about, and should be facilitating, not blocking.